Join us as we stand together against bullying! You can raise awareness at any time of the year with our fantastic Bullying UK wristbands. We'd love you to help #choosekindness by spreading positive messages and showing your support. 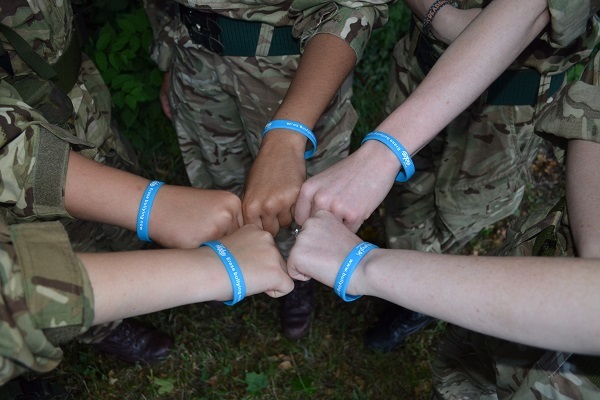 All proceeds from the wristbands will help us continue to support people affected by bullying. Our wristbands are a great addition to a non-uniform day, bullying awareness day or a part of our annual Wear Blue Day. Wristbands are 202 x 12 x 2mm and cost 50p each including VAT, with an additional postage cost which covers 2nd class postage. There is a minimum order of 50 wristbands. Payments are made by card. If you can't pay by credit or debit card, please email bullyinguk@familylives.org.uk and we can arrange an invoice for you. Please order your wristbands with a debit or credit card by using the form below. Please allow approximately 10 working days for delivery. Find out more about how you can support us and download our anti bullying week fundraising pack for ideas on raising money for Bullying UK.